I’ve come around, and decided, a couple of years ago, that Brussels sprouts were worth growing, despite their high demands on space and time. For good production in northern climates, the seeds need to be sown indoors in early March, and then harvest doesn’t start until October or sometime after the first frost. And for all that waiting, each plant — a mere single stalk with whorls of leaves from top to bottom and a sprout at the base of each leaf — takes up an area of about three feet by three feet. Gustas Brussels sprouts, standing up straight. Things would be bad enough if a Brussels sprouts plant just grew straight up to fill its allotted area. But the plant can’t support itself, so in its youth it flops down on the ground. Once that supine stem has created a firm base upon which to rise, the end of the growing stem curves more or less upward according to original plan. That youthful waywardness wastes and muddies lowermost sprouts, with the sprawling plant demanding even more space, which is a problem in an intensively-planted garden. This summer, before the plants even had time to consider flopping down, I poked a bamboo pole into the ground next to each one, which I tied to the pole, adding ties to keep up with growth. Perhaps a bit too orderly for a vegetable garden, but my Brussels sprouts “trees,” each now over four feet tall, look quite attractive. The “trees” are not likely to grow much higher because I pinched out the top bud of each plant in early September. This pinching redirects the plants energy from the highest growing point to the side shoots — which are the sprouts. All month, the sprouts have been fattening, soon to be snapped off and eaten. I also count among this season’s successes two little-known flowers, both of which elicited “oohs and ahhs” from visitors here. One of the flowers were Signet marigolds. You might think, marigolds?, they’re okay, but more “ho hum” than “ooh and ahh.” Not so. Signet marigolds, Tagetes tenuifolia, are a different species from common marigolds, and they look a little different. Mostly, they’re smaller, expanding into amorphous mounds of fine, lacy, lime-green leaves, from which stare out small yellow or orange blossoms — most charming. A lemony-marigold aroma wafts from both the blossoms and the leaves. 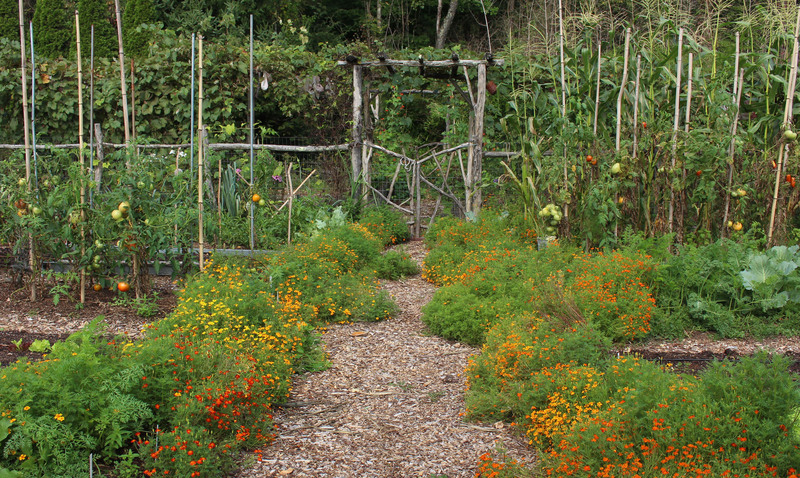 Actually, the aroma can waft over the whole garden if you plant enough Signet marigolds — which I did this year. In the past, the seeds never germinated very well for me, so I just spot planted what few seedlings I could raise here and there in the garden. This spring, in mid-April, I sowed the seeds densely in an 8 by 6 inch seed flat. The dense planting led to an excessive number of crowded seedlings. While they were still young, I gently lifted each one to transplant into its own potting-soil-filled cell to grow for a month or so before planting out in the garden. The few plants I poked in at the feet of vegetable beds on either side of the main path through the vegetable garden have grown into sprawling mounds that wash into the main and side paths of the vegetable garden like seawater into an undulating beach. 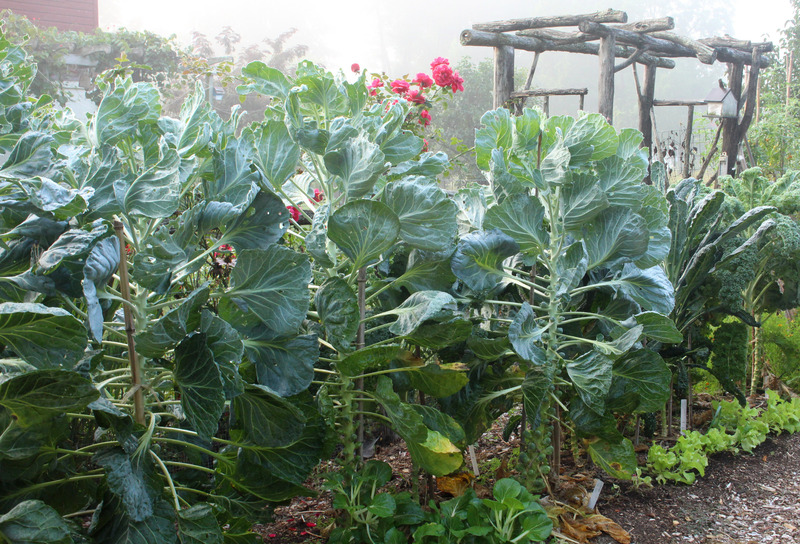 The flowing mounds effectively soften any excessive orderliness of the garden — from the soldier-straight Brussels sprouts plants, for example. My grape arbor creates a horizontal roof nine feet above my terrace. Each of the four grape vines rises to that height on a single trunk. What an opportunity for a climbing vine, especially one that climbs by twining! My other floral success this year has been with such a twining plant, cardinal climber (Ipomoea x multifida, a hybrid created by mating I. coccinea and I. quamoclit). In the past, other species of Ipomoea climbed those trunks. Morning glory was one, but that only blooms, of course, in the morning. Moonflowers have also dressed up the trunks, but they bloom only at night. So this year, cardinal climber was the Impomoea species for the grape trunks. It blooms all day long, clothing itself in blossoms from top to bottom. The size and color of the blossoms, an inch or so across and cardinal red, seem best for relatively close viewing when sitting on the terrace. No need for these flowers to soften any excessive orderliness of the arbor. The grape trunks wend their way skyward and their long, new shoots create plenty of disarray except right after they are pruned each spring. This entry was posted in Design, Flowers, Gardening, Vegetables and tagged brussels sprouts, cardinal climber, Ipomoea x multifida, Signet marigold, Tagetes tenufolia. Bookmark the permalink. Trackbacks are closed, but you can post a comment. I have always wanted to grow signet marigolds, I hear they are edible. where did you get your seed? I got the seed from http://www.fedcoseeds.com. I’m a huge fan of cardinal climber. It climbs our arbor and attracts more attention from hummingbirds than the feeders or any other flowers in our beds. I’ve read here and elsewhere that it’s a hybrid, but we’ve nonetheless been successfully saving seeds and it’s grown true to form (just like your picture) for 6 years. If you aren’t doing so, you might try saving seeds from your vines rather than ever buying cardinal climber seeds again. 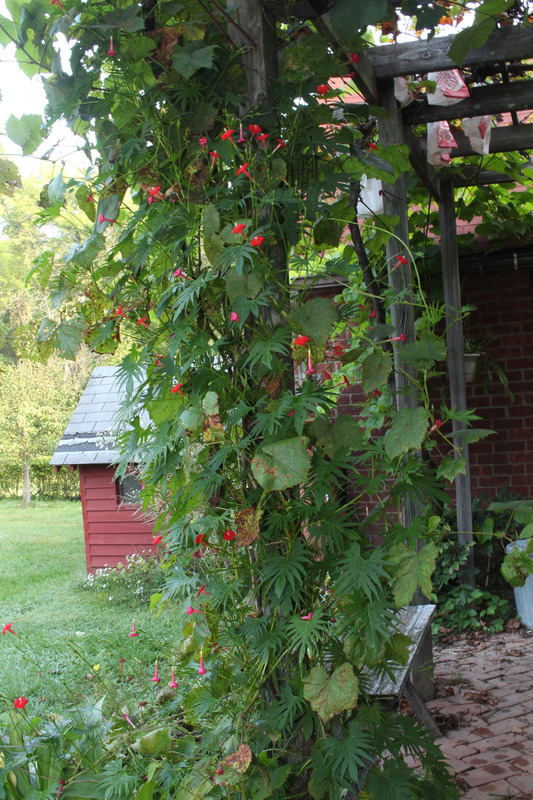 There actually are two closely related plants called cardinal climber. One is Ipomoea x multifida, a hybrid. And the other is I. quamoclit, one of the parents of the hybrid. I will save seeds if the made them.